Pat Liddy’s renowned walking tours will now offer visitors and Dubliners the chance to discover the heritage of Bewley’s Grafton Street in a one of kind experience. 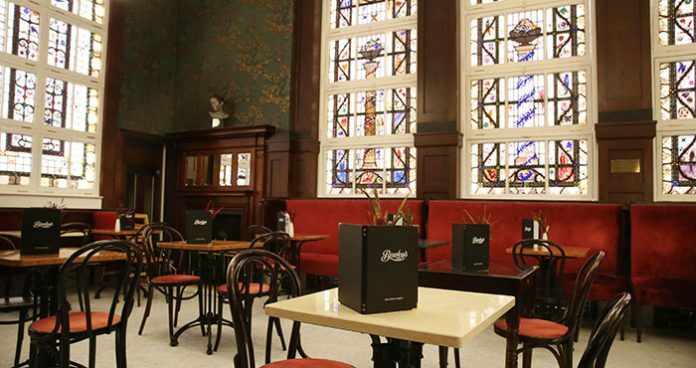 Visitors on the walking tour will get the chance to discover the many outstanding elements of the original Bewley’s café which are now fully restored, including the Harry Clarke windows, ten beautiful open fireplaces and the Egyptian-motifed façades on Grafton Street and Johnson’s Court. Not many ones know that the Duke of Wellington (twice British Prime Minister) attended school in the building that is now Bewley’s Grafton Street or, that the first ship ever to sail directly from China to Ireland held 2,099 chests of Bewley’s tea. Bewley’s Grafton Street is also an art-lovers dream with recent additions of stained glasses and wonderful sculptures. Following the tour, guests will complete their Bewley’s experience with a Bewley’s tea or coffee and a choice of freshly baked delicatesse. Bewley’s teas and coffees are available in Bewley’s Grafton Street, as well as in supermarkets nationwide and online.